The one thing that was most important for us was ability to play music, games, and/or movies at low volumes without sacrificing the quality of audio output in the low, mid and high ranges i.e bass coupled with the crispness, richness of sounds. In addition, the HD sound effect was something we really cared about so the combo of a good bass plus excellent mid range sound was critical. The Logitech Z-2300 comes through shining on that one very important criterion really well - the sounds are extremely pleasing to the ear with the freshness, crispness and clarity from the Satellites along with the bass effect produced by the powerful subwoofer, that I can only compare to the high end Mirage Nanosat 5.1 Speakers that we have, serving us well for over two years in our TV room. 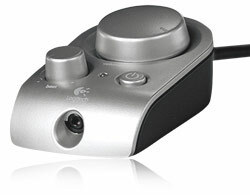 In addition, the Logitech Z-2300 has a convenience that makes it very useful compared to other computer speakers - it has a wired remote control for controlling master volume, subwoofer level and power in addition to a handy headphone jack on it. I also like the angled upward facing style of the speakers that makes sound be delivered upwardly in the small room giving a well rounded surround feel. One would also usually, expect to hear a low hiss sound coming from speakers of such high wattage - I did not hear any until I turned up the volume level beyond 60% and that was really really loud. The sound output was one of the best, I have heard in a long time from computer speakers and this went beyond all our expectations. I also had a test of 5 songs from different albums that I love to hear in different ranges - on all five, I found the output to be great except in one where mid-range was critical - adjusting the EQ a bit higher helped fix that. The Logitech Z-2300 comes at around $114 at Amazon.com. We paid $114 as no sales were around at the time but Amazon offers free shipping so that's another saving of $25 given the dimensions and weight of the product for shipment. For this price range, the product offers audio quality only comparable with some of the higher end products. I own a Harmon Kardon Receiver AVR 347 system coupled with the Mirage Nanosat 5.1 Speaker system that the Logitech Z-2300 compares to very well in that for a small room where computer based multimedia applications are at play, this is a great addition/replacement from the conventional computer speakers we are all accustomed to from the past. 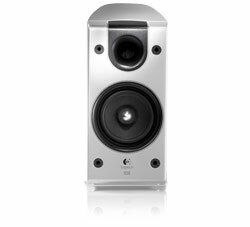 :-) The Logitech Z 2300 speakers are the best PC speakers in the market today at a great price. Note that these are 2.1 speakers and not 5.1 speakers i.e. 2 speakers and 1 sub woofer and not 5 speakers and one sub woofer. Hence surround sound is not something you should expect from these speakers. Phase Plug Drivers - a conical aluminum plug at the center of the driver to accurately produce high and mid range sounds with far less coloration (term used to denote the need to adjust EQ settings each time a different genre of music plays). Rich Bass through an 8" 120 Watt Subwoofer - this is truly a high end sub that enhances the overall experience to a different level. SoundTouch wired Remote Control for easy controls of master volume, sub level and power with a headphone jack. Audio Adapter to connect easily to Gaming Sytems and Consoles. Our package arrived in just 3 days although the free super saver shipping meant a wait of 8 days - that was super quick delivery. Frequency response: 35 Hz–20 kHz - This is an awesome frequency range for the price point of this product as it would pick up the lowest lows and highest highs very well. Some of the things I have noticed that are worth considering are that the Subwoofer is a fairly large size box so consider whether it will fit under your computer desk. It contains a heat vent on the back so leave enough space on the back side. 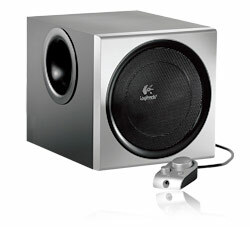 The Subwoofer is also the source for all connections such as the Satellites, Remote Control, the SoundCard on your computer, Power Source etc. So ensure the sub is kept where the wires reach out well to the concerned sockets. One relief for me was there was no AC-DC adapter so it was a great to plug it straight to the wall socket. Another point worth noting is to connect all end points before connecting to the power socket. This will prevent any unforeseen surge related issues right at the outset and protect the unit from any impact of that. If sound mid ranges or any other aspect of sound is below your expectations, ensure you check the media players' equalizer settings and adjust it so it is to your comfort. I highly recommend buying the Logitech Z-2300 given the quality and rich experience it offers at a great value. Very nice review - these are kickass speakers and I can say for the price range these are well worth more than you pay for. Have had the Logitech Z-2300 for about six months now. Thanks for the review. I bought the speakers on Cyber Monday and am I glad or what! At $79.99 these are truly a steal and I love the fact that the bass can be super pleasing even in super low volumes - perfect for an evening with smooth Jazz music and some fine wine, if you know what I mean. Thanks for the detailed review as it helped me take the decision and buy it. I am glad I came by this review. Great review. A question I had with respect to plugging this into laptops. Can this work with any laptop with a headphone jack? I mean does it use USB or just the 3.5 mm audio output jack that one uses for headphones? The price of $99 is pretty attractive for such good speakers. Yes, the speakers use the 3.5 mm audio output jack and not USB. Although one would think this would mean loss of signal due to the analog nature of the 3.5 mm jack, the output is actually pretty good. Hope this helps.